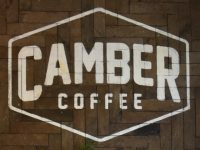 To celebrate its first birthday, I present today’s Coffee Spot, Newcastle’s Camber Coffee (which turns one tomorrow, having opened on 6th July 2017). Located on the first floor of a combined cycle and fitness store, Start, it’s right in the heart of Newcastle city centre, but, paradoxically, easy to walk past. I spotted its window-display as I wandered along, but I’d already been tipped off by Joe of Flat Caps Coffee that it was one to visit, so I popped in for breakfast. It’s a large space, particularly for a speciality coffee shop, although it probably only occupies about one third of the actual floor-space, the rest of the first floor being given over to bicycles, continuing the strong association between speciality coffee and cycling. The coffee comes from Pilgrims Coffee, a café/roastery on Holy Island, just off the Northumbria coast. There’s a house-blend on espresso, with batch-brew filter if you’re in a hurry, or a single-origin option on pour-over through the V60. This is all backed up with concise breakfast and lunch menus, plus cake and sandwiches. Originally vegan when it came to the food, Camber is under new management and is now adding vegetarian items to the menus. July 2018: Camber Coffee is now under new management, being run by North Shore Coffee Co. There’s now a choice of two rotating single-origins on espresso and another on pour-over through the Kalita Wave. Camber Coffee is on Market Street, occupying part of the first floor of the cycling/fitness shop, Start, whose owner invited Camber in, since he wanted a speciality coffee shop on the premises. Camber has no direct entrance from the street, although it does have a large, eye-catching window display and a couple of A-boards on the pavement. Even so, you could easily miss it if you’re not paying attention. There are two ways into Camber, either through the fitness part of the store on the right (the more direct route) or through the bicycle part on the left. Either way, follow the signs which direct you to the massive bright, airy space on the first floor that is Camber’s home. If we consider the front to be the slightly curved façade that runs along Market Street, then the counter, a staggered, two-part affair, is off to the left. Depending on how you got up to Camber, you enter either at the far right-hand end (through the bike shop) or from the back by the counter (through the fitness shop). Either way, revel in Camber’s size, with its high ceiling, clean lines (which come from the white-painted walls and ceiling) and, above all, glorious light, provided by seven almost floor-to-ceiling windows which regularly pierce the curving front wall. The layout is surprisingly simple and very communal. There are five six-person tables lining the front wall, one for each of the first five windows (the last two are by the counter, with the last of these occupied by a two-person window-bar). The tables are simple, wooden, trestle-like affairs, with the narrow side facing the window. The centre piece is a massive communal table, lined with books, which runs length-ways down the centre of the space from the third to fifth windows, a long bench along the window-side, with seven stools on the other side and two at either end. This is slightly curved, matching the curving front of Camber Coffee. There’s more seating in a cosy corner at the back on the right, where there are four comfy chairs in an L-shape, with three coffee tables in matching configuration. Finally, between the two doorways which pierce the back wall, giving access to the toilets and the stairs up from the fitness shop, is a solitary two-person table. I was there for breakfast, which is served from a simple toast, porridge and granola-based breakfast menu from which I selected the avocado on toast. This consisted of mashed avocado on a single, large slice of toast, topped by feta cheese and salad leaves, a really tasty combination. I paired this with a rich, smooth flat white, which was a great way to start my day. The espresso blend, Daily Bread from Pilgrims Coffee, is unusual in that it’s a blend of two washed Indian Arabica coffees, 70% being an SLN 9 varietal and the remaining 30% a Catuai varietal. I followed this up with a V60 of a naturally-processed Rwandan Red Bourbon varietal from the Nyamasheke district, again roasted by Pilgrims Coffee. This smelled absolutely gorgeous in the bag and was just as good once brewed. Served in a carafe with a glass on the side, it was a lovely, fruity coffee, which tasted just as good cold as it did hot. This entry was posted in Bike Shops, Breakfast, Cafes, Cake, Dinner, Laptop Friendly, Newcastle & Gateshead and tagged include, Pilgrims Coffee by Brian Williams. Bookmark the permalink.